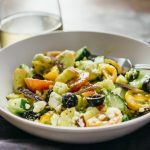 A delicious chopped Greek salad with creamy avocado dressing. Add all dressing ingredients to a small blender, immersion blender, or food processor. Blend until smooth. Add cucumbers, tomatoes, apples, onions, and olives to a large mixing bowl. Add about a third of the dressing. Stir everything together to mix. Top the salad with feta cheese, gently stirring it in. Serve with reserved dressing on the side. Refrigerate any leftovers. This recipe yields 15.5 g net carbs per serving.